UK employment data expected to confirm healthy progress in the sector. Brexit stalemate continues, without progress in Corbyn-May talks. The GBP/USD pair settled slightly below the 1.3100 figure, up for the day amid absent demand for the greenback. The UK release the Rightmove House Price Index at the beginning of the day, which increased by 1.1% MoM and declined by 0.1% YoY, better than the previous month figures. The UK will release this Tuesday its latest employment data, with the unemployment rate expected to remain unchanged at 3.9% for the three months to February. Earnings during the same period are seen up to 3.5% including bonuses, and unchanged at 3.4% excluding bonuses. The Claimant Count Change is seen at 20K in March. Overall, the UK's labor sector has done well for almost a year now, and no surprises are expected there. If something, wages' growth is expected to continue above inflation. In the Brexit front, nothing has changed, without progress in May-Corbyn talks. The issue has been set temporarily aside after the EU granted the kingdom a flexible extension up to October 31. The pair continues ranging within familiar levels, with sellers rejecting the advance on an approach to the daily descendant trend line coming from this year high, currently at around 1.3120. 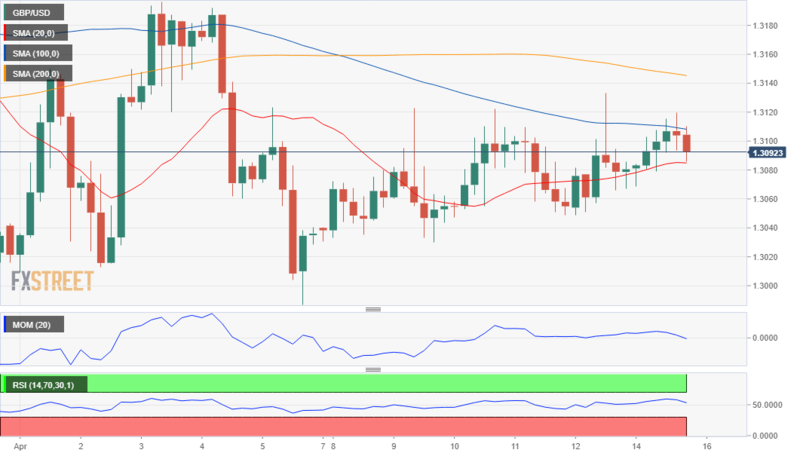 In the 4 hours chart, the GBP/USD pair offers a neutral-to-positive stance, seesawing around a directionless 200 EMA but steady above a bullish 20 SMA, as technical indicators hold above their midlines, failing to provide clear directional clues.